Everton Terrace: andrew henry's world..
"This truck was in front of me on the way work. It cracked me up so I took a photo to show Jeanette. For some reason she didn't seem to think it was as funny as I did. It's still making me laugh. Do you think this is a guy thing?" Well, funny or not, hope you all have a great week! Oh No - so NOT a guy thing - I think it it HILARIOUS! Made me chuckle all over! So random - I love random funniness! I am definitely contributing a chuckle for the shackled Elmo!! ha! no i think it's adorable:) the things men think of crack me up. I think it is funny that he would think you would think it was funny! 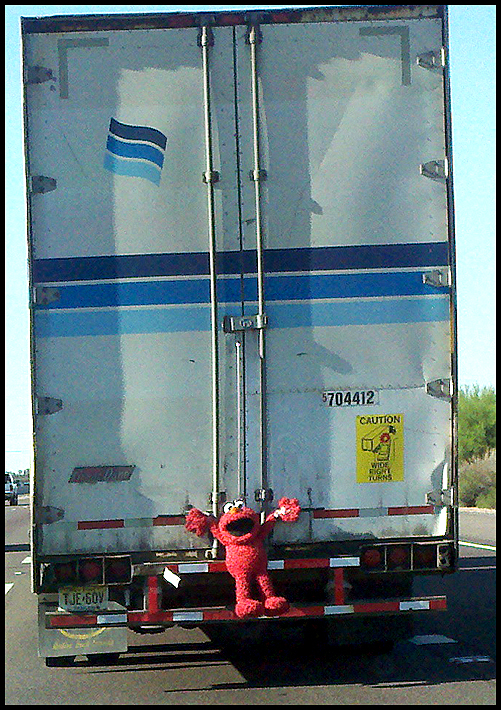 It made me smile.... maybe it is just seeing Elmo ? haha -that is pretty funny! Not necessarily a guy thing: I giggled.